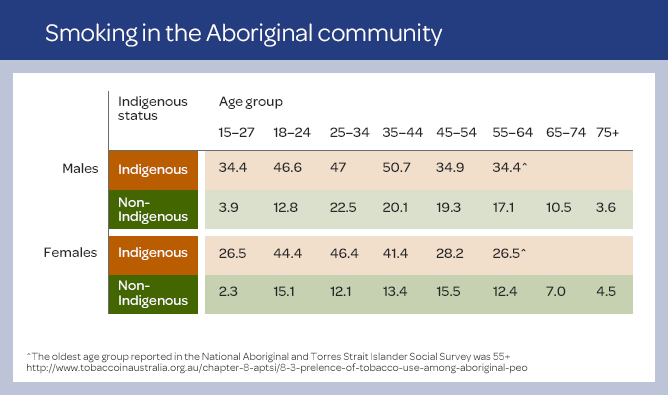 Smoking prevalence within Aboriginal communities is still much higher than in non-Indigenous communities. Stark figures, such as a life expectancy 10 years younger than non-Indigenous people reaffirms the need for continued commitment to Aboriginal Programs to tackle smoking. Smoking rates among Aboriginal and Torres Strait Islander people still remain over 3 times the national average of non-indigenous people – but the good news is that smoking rates are declining faster in Aboriginal communities than the general Australian population. Although smoking rates are declining, it is simply unacceptable that, still, 1 in 5 deaths are attributed to smoking. It is important to work towards closing the 10 year life expectancy gap, with smoking being a major contributor. Lung cancer is by far the greatest source of cancer burden in Indigenous Australians. For Indigenous Australian men, it is 2.3 times higher than non-indigenous men. For Indigenous Australian women, it is 2.6 times higher than non-indigenous women. This accounted for more than 3 times the burden of bowel cancer, the next most burdensome cancer. Intergenerational trauma is often found among Aboriginal people. When people experience trauma, the wounds can also affect their children, and their grandchildren, and their great grandchildren. When someone is traumatised by a difficult event, their life is often turned upside down by emotional ‘wounds’. And if they are unable to heal those wounds themselves, they can pass them on to their children. Smoking rates vary for different age groups. Focusing on the positive side, between 2002 and 2013 the amount of ex-smokers has increased from 15% to 20%. Also, the proportion of never smokers has jumped from 33% to 36%. If we can increase our proportion of ex-smokers and never smokers, we will truly be on our way to improving the overall health of Indigenous people. In 2012, almost half of Indigenous mothers smoked during pregnancy – 48% compared to 13% for non-indigenous mothers. There are fewer elders these days offering support and advice due to a shortened life expectancy. Many mothers cope with depression and anxiety, using smoking to manage their stress, although this increases their risk of further health issues. Ear problems. Examples include an increased risk of ‘glue ear’, which causes hearing loss, learning problems and behavioural problems. Lung problems. Children have a greater risk of asthma and bronchiolitis, followed by chronic lung disease in adulthood. Becoming early smokers. These children are more likely to become smokers themselves. Some try smoking as young as five years old. Heart attack or stroke. The risk of a heart attack or stroke increases as they grow up. Research has found that many Indigenous health workers who smoke, smoke heavily, and that tobacco use provides a means of coping with the stressful nature of their workloads. These studies indicate a need for appropriate support and education for health workers as well as the communities in which they work. Findings have ranged between 38% and 51% so it is important that everyone who smokes is given appropriate advice and support to quit smoking. Quitting smoking can be a team effort. If someone in your community is trying to quit smoking, there are steps you can use to guide them through the journey. What is the Aboriginal Quitline? 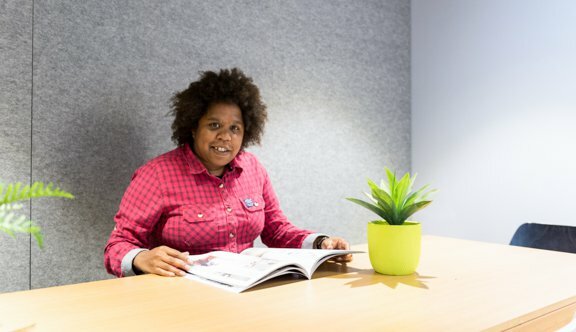 Quitline has proven to be one of the most successful methods to support people to quit for good, and it is an increasingly popular support method for Aboriginal Victorians to cut down or quit.